For other meanins, see Demeter (disambiguation). made for the Eleusis sanctuar circa 425-420 BC. In auncient Greek releegion an meeth, Demeter (/diˈmiːtər/; Attic Δημήτηρ Dēmētēr. Doric Δαμάτηρ Dāmātēr) is the goddess o the hairst, who presidit ower grains an the growthiness o the yird. 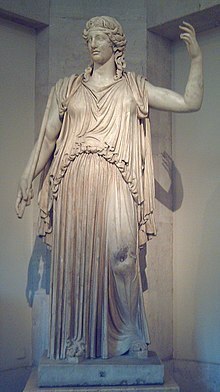 Her cult titles include Sito (σίτος: wheat) as the giver o fuid or corn/grain an Thesmophoros (θεσμός, thesmos: divine order, unwritten law) as a merk o the ceevilisit existence o agricultural society. Tho Demeter is aften describit simply as the goddess o the hairst, she presidit ower the sanctity o marriage an aw, the saucrit law, an the cycle o life an daith. She an her dochter Persephone wur the central figurs o the Eleusinian Meesteries that predatit the Olympian pantheon. In the Linear B Mycenean Greek tablets o circa 1400-1200 BC foond at Pylos, the "twa mistresses an the keeng" mey be relatit wi Demeter, Persephone an Poseidon. Her Roman equivalent is Ceres. ↑ Eustathius of Thessalonica, scholia on Homer, 265. ↑ John Chadwick, The Mycenean World. Cambridge University Press, 1976. ↑ Hesychius o Alexandria, s. v.
Ingri and Edgar Parin d'Aulaire, D'Aulaire's Book of Greek Myths, 1962. An illustrated beuk of Greek myths retold for children. Hesiod, Theogony, and Works and Days in The Homeric Hymns and Homerica with an English Translation by Hugh G. Evelyn-White. Cambridge, MA.,Harvard University Press; Lunnon, William Heinemann Ltd. 1914. Pausanias, Pausanias Description of Greece with an English Translation by W.H.S. Jones, Litt.D., and H.A. Ormerod, M.A., in 4 Volumes, Cambridge, MA, Harvard University Press; Lunnon, William Heinemann Ltd. 1918. Wikimedia Commons haes media relatit tae Demeter. This page wis last eeditit on 18 November 2017, at 20:21.